Z’Tejas Southwestern Grill invites Valley residents to enjoy their 12th annual Chile Feast using the seasonally grown favorite Hatch New Mexico green chile! Beginning August 1 to mid through October 15, Z’Tejas will offer their innovative Chile Feast menu at all five Valley locations. Sink your teeth into the Green Chile Queso or the Prime Pork Chop Milanesa stuffed with roasted pepitas, hatch green chiles, goat cheese and crispy jalapeño bacon! Our chefs and entire culinary team have outdone themselves on this exciting new menu for our Chile Feast,” said General Partner Mike Pottorff. “We are excited to celebrate the Southwestern cuisine by creating exceptional specialties with a seasonal ingredient”. Green Chile Queso – With roasted jalapeños, grilled green onions, Hatch chile relish. The Hatch Chile Burger – Fresh ground chuck topped, with roasted Hatch chile relish, green chile queso, pickled red onions, and crispy tortilla strips, on a toasted ciabatta bun accompanied with cotija and cilantro fries. Achiote Marinated Mahi Mahi – Topped with a roasted Hatch chile and fresh strawberry relish, served over saffron chile rice, tender asparagus and finished with a balsamic drizzle. Pepper Crusted Center Cut Beef Filet – Stuffed with Hatch chiles, caramelized onions, crimini mushrooms and goat cheese, served with green chile mash, tender asparagus and a sweet and sour black bean sauce, topped with pickled red onions. Bacon Wrapped Chicken Stuffed Roasted Jalapeño – With Z BBQ sauce and Hatch chile relish. 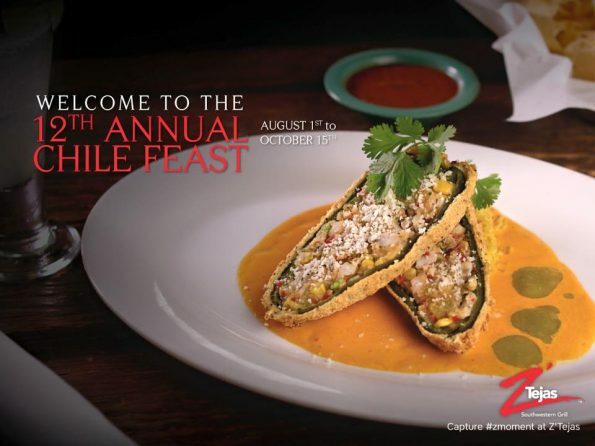 Cornmeal Crusted Stuffed Hatch Chile Relleno – Stuffed with roasted shrimp and gulf crab meat, served with saffron green chile rice, roasted red pepper cream sauce and chipotle oil. Prime Pork Chop Milanesa – Stuffed with roasted pepitas, Hatch green chiles, goat cheese and crispy jalapeño bacon, topped with a blueberry pineapple relish and finished with a roasted tomatillo sauce. Next → Next post: House of Tricks is Back with H.O.T. Summer Savings!